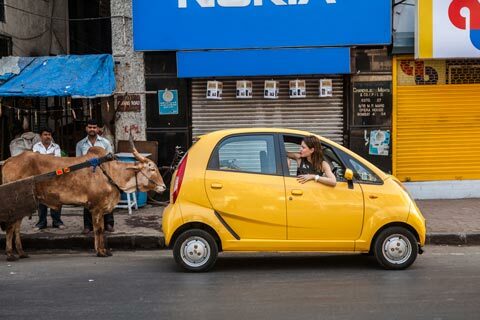 Tata’s Nano, introduced a few years ago as the world’s cheapest car, didn’t inspire much love or confidence. 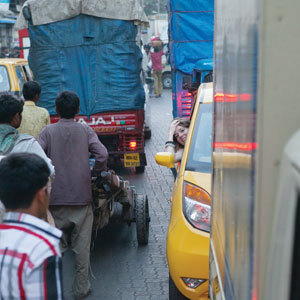 That didn’t stop British writer VANESSA ABLE from driving around India in one—solo. Was she hardy or foolhardy? Perhaps both, but it’s clear that she had a blast. The horn is not an everyday phenomenon; it’s an every minute to every second occurrence.... It’s a dialect, a currency, a complex system of signage and exchange that, through a grueling process of trial and error, I was slowly beginning to fathom. Many a cautionary Indian road tale attests to the imprudence of truck drivers owing to the alleged overconsumption of marijuana, booze or doda, an opium and betel-nut tea. Suspicious urban legends or not, further evidence of truckies’ psychedelic tendencies can easily be seen in their trucks themselves and the brightly colored paintings that adorn the exterior bodywork, often accompanied by lights or bunting. Added to this are the giant horns and long spindly antennae the drivers are wont to pimp their rides with, as well as depictions of Ganesha, Hanuman, and the saintly faced Shiva, surrounded by varieties of bizarre flora and fauna. Put all together and the trucks easily come to resemble Ken Kesey and the Merry Pranksters’ bus: an electric kool-aid doda-and-weed ride into the mindbending Indian night. 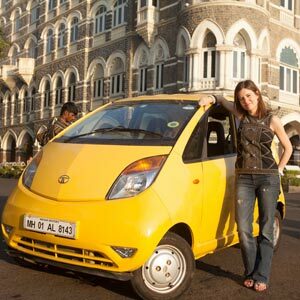 It took Vanessa Able three months, and roughly 10,000 kilometers, to drive around India in her Nano. At first, I thought I got the gist: please horn, OK? For the enormous trucks that rarely made use of their rear-view mirrors, it was essential to let them know of your desire to pass. However, I did find myself pondering, especially after several hours of chevron hypnosis, that there might in fact be more than one way of viewing this curious assemblage of words. Was ‘horn’ a command or a simple noun in this case? How to interpret the combination of the collaborative ‘OK’ with the supplicatory ‘please’? The more I thought about it, the less sense the phrase made and the more the three words appeared to have accidentally collided with one another to make a vaguely baffling bumper sticker. Senseless haiku or not, the horn is without doubt the single most important component of a car in India. The horn is not an everyday phenomenon; it’s an every minute to every second occurrence. Just as English is the country’s lingua franca, handy for ironing out conversational difficulties in a nation with 22 other official tongues, the horn is the major method of communication between its hundreds of millions of road users. It’s a dialect, a currency, a complex system of signage and exchange that, through a grueling process of trial and error, I was slowly beginning to fathom. The most important preconception for me to tackle when it came to diving into the hooter game was that horns always implied hostility. During [the Nano] Abhilasha’s maiden voyages in Mumbai, the sound of any horn within a twenty-meter proximity had me spinning around to find the perpetrator, as though every beep and parp of the road was exclusively aimed in my direction. But what I gradually came to learn—and this did wonders for my blood pressure—was that the horn covered most forms of road communication that might in other cultures be transmitted through the indicator lights, mirrors and various other subtler forms of road etiquette. 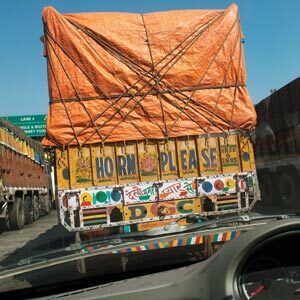 The most common application was during the overtake: I learned that in India, it’s only courteous, just before passing someone—any vehicle, not just a truck—to give them a quick honk of warning. If someone is crossing lanes in front of you on a highway, a triple beep is most useful in giving them a better sense of their room to manoeuvre, while a well-timed, well-mannered parp is usually enough to gain access from an obstructive vehicle at a traffic light. Abhilasha’s humble horn also turned out to be an excellent shepherding tool when faced with herds of sheep, goats, cows, and bullocks strolling over highways, or making their way down country lanes, as I discovered that even India’s ungulates were savvy to the parley of the road. There were many different types of horns, from drum-shattering sirens and vuvuzela-inspired rackets to novelty musical beepers and those squeezy rubber parpy things championed by The Great Gatsby. On the highways at least, a good horn really sorted the wheat from the chaff as far as mobility was concerned. The drivers of trucks and buses, for example, displayed a penchant for ear-piercing musical numbers that were loud and fearsome enough to make the earth tremble. One of those coming from behind with an alarming intensity of Doppler shift was extremely efficient at making me move, as I learned quickly that the sound would be emanating from a large and unusually speedy lorry on a suicide mission. Such vehicles were wont to drive remarkably long distances with the horn in a state of constant depression, a tactic I can’t say I didn’t admire just a tad. I often thought the Nano’s horn was not quite as powerful as it could have been. Later on in the trip, it even started to give off little quivers and shakes like a soprano in a bad state of training and after three chain-smoked packs of Lucky Strikes. I began to think that other drivers who couldn’t see the source of its wee hoot thought they were dealing with a two-wheeler, as that was often the amount of space they allotted for passing. Or sometimes they didn’t move at all, a flagrant defiance of my newly discovered road lexicon that invariably brought out in me what came to be known as The Spirit of Braveheart. The Braveheart Tactic involved emulating at least the attitude (if not the terrifying volume) of a cross between a fearless, warmongering William Wallace leading his armies into battle, and the king-of-the-road stratagem employed by the previously mentioned monster trucks who drove with their horns on perma-blare. If the vehicle ahead of us gave me so much as a few centimeters to work with, I would go postal with the blasts, shooting them out in rapid fire so the vehicle in question could know exactly what kind of psycho they were dealing with. As I passed in bloodthirsty mode, I kept the horn going all the way till the end of the overtake. If Abhilasha had a face, it would have been red by this point. Horn please? Okay, and then some. Reprinted from Vanessa Able’s Never Mind the Bullocks: One Girl’s 10,000 km Adventure Around India in the World’s Cheapest Car. Courtesy: Nicholas Brealey Publishing.